Click below to read Forza's article on this modified 365 GTC/4. This Ferrari 365 GTC/4 has been specially modified by Carobu Engineering. The modifications include a 5.0 liter C/4-412i hybrid engine, Brembo GT "Big Brake" kit, 17" Razzo Rosso wheels and height adjustable suspension. The C/4 is a "sleeper" Ferrari whose image was outshined by the popular Daytona. However, the elegant Pininfarina styling, and the steady road manners of the car made it an excellent basis for modification. The front engine/transmission Ferrari 365GTC/4 was introduced to the world at the 1971 Geneva Auto Salon as the replacement of the 365 GT 2+2. The C/4, as it is commonly known, had a distinctive flowing wedge-profiled body designed and built by Pininfarina in Turin. The C/4 body was comprised of welded steel panels and aluminum trunk and hood over a steel frame. The car was in production for 18 months with a production of a mere 500 cars. The plan included rebuilding the engine with a "balanced" combination of parts and modifications to produce a strong yet flexible power curve combined with street reliability. The paint/bodywork needed attention too; the front spoiler was smashed and the front and rear lids had bad fits on the right side. The paint was a quickie re-spray over the original factory black color and it looked tacky with various masking errors. Additionally, the "blackout" on the rear deck and door jams was done incorrectly. The goal of this project was to increase the power and torque of the engine while retaining the balanced character and stock appearance of the C/4. In order to accomplish this, it was elected to install the 5.0 liter engine from the later 412i. The 412i engine is based on the same basic block with raised deck height and made an excellent basis for the C/4 project. In stock form, the 82mm bore and 78 mm stroke results in a 4942 cc displacement. 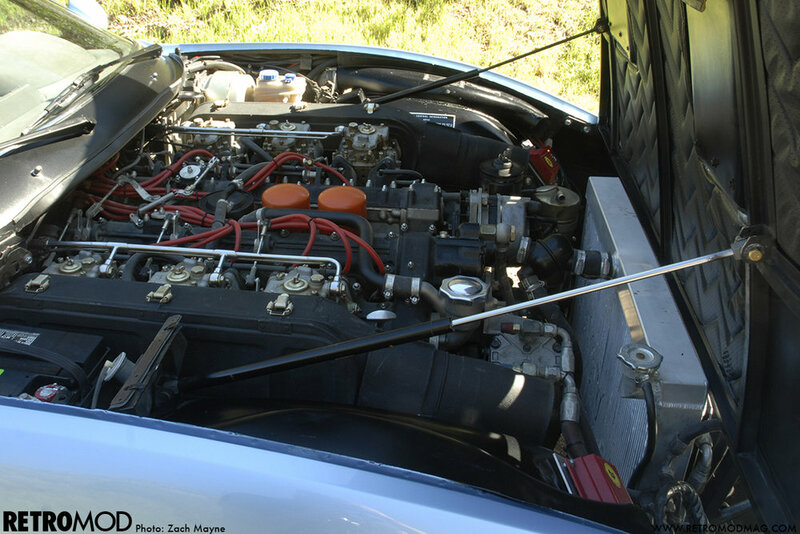 The 412 engine was rated at 340 hp at 6000 rpm in the original configuration. For this project, the stock C/4 Weber carburetors and air boxes were retained. To properly utilize the additional lift and duration provided by the CAROBU camshaft, the intake and exhaust ports were massaged to match the port flows with the camshaft. Computer simulation modeling was used in order to determine the ideal intake and exhaust flow profiles. Figure 1 illustrates the head flow, in cfm at 28" of water, of the intake and exhaust ports for the original 412i heads and for the "ported" 412i heads. The original heads flowed 127.2 cfm at 0.350" valve lift. After porting, the intake port flowed 144.7 cfm, and increase of 17.5 cfm or 13.8% increase over stock. The intake port positioned between the intake and exhaust cams and manifold configuration of the C/4 is less than ideal for engine breathing. For comparison, the 365 GTB/4 Daytona project engine, with a more advantageous intake port design, had an intake port flow @ 0.350" lift of 168.4 cfm at 28" of water. The exhaust ports of the heads were not ported as the computer simulation predicted that additional exhaust port flow would not improve the low speed torque of the engine. The exhaust port flowed 127.9 cfm at 28" of water. Since the K-Jetronic Bosch injection of the 412i would not be adequate for the modifications of the project engine, and to keep with the original character of the C/4, it was decided to keep the 38 DCOE side-draft Weber carburetors, fitted with larger 32 mm venturis. This required some modification of the 412i heads to accommodate the C/4 intake manifolds including plugging the injection ports in the heads. It was also necessary to modify the heads to accommodate the C/4 distributor drives. A Black Stallion solid state electronic ignition kit with programmable ignition timing was fitted. This kit includes a special stock-appearing distributor with Hall-sensor trigger, ignition coil, wiring harness, spark plug wires and a programmable ignition module. The kit allows for a reliable ignition upgrade while retaining a completely OEM-look. Some of the features of the ignition include extreme accuracy in ignition firing, live ignition curve adjustment, in-car switching between two preprogrammed curves, and "soft" engagement rev limiter. With these modifications, the engine has actually become a 365GTC/4 – 412i hybrid. The 82mm bore and 78 mm stroke of the 412i engine was retained resulting in a 4942 cc displacement. Based on the engine simulation modeling, it was decided to increase the compression ratio to 10:1. This would provide increased power and allow for the use of premium pump gas. The engine was equipped with Razzo Rosso forged aluminum pistons. The stock connecting rods were replaced with steel Carrillo rods. The stock Ferrari crankshaft was retained. Upon completion of the engine build, the engine was tested on the CAROBU Engineering DTS dynamometer in order to break-in the engine, tune the carburetors and set the optimum ignition timing/advance curve and to test the engine performance. Running the engine on an engine dyno is also helpful in that small issues such as oil, and water-leaks can be located and corrected while the engine is out of the car. The CAROBU dyno facility was also designed with the capability of running the complete under car exhaust system to insure proper tuning. Following break-in and tuning, this engine produced maximum power of 410 HP at 6,400 rpm and maximum torque of an amazing 385 lb-ft at 4,500 rpm. This engine makes 90% of maximum Torque by 3,800 rpm. No one can say that this Ferrari lacks low-end torque! By comparison, the original C/4 engine, dyno tested in the "as-received" condition, made 291 HP at 5,300 rpm and 300 lb-ft at 4,900 rpm. Admittedly, the original engine was weak. As mentioned earlier, this car was fitted with a non original, custom, stainless steel exhaust system. The original Ferrari exhaust, and the Tubi-Style system include a center resonator section that "connect" the front three cylinder with the rear three cylinder exhaust on each side of the motor. This provides a secondary tuning effect providing for a broader power band and increased horsepower and torque. The original "modified" system had deleted the center resonators, thus isolating the header branches. Both systems were tested on the dyno. The Tubi system made nearly 5 HP more at maximum power and 8 more lb-ft of maximum torque. But what is really evident is the improvement in mid-range torque. At 4,100 rpm, the Tubi system produced nearly 45 more lb-ft of torque! The additional power of the engine required improved cooling. To increase the cooling capacity, an aluminum radiator was installed. The thermal conductivity of aluminum is almost double that of brass, greatly increasing the ability of the radiator to reject heat. This is a direct replacement aluminum radiator, 100% TIG welded with multi-louvered fins and billet machined fittings. The aluminum radiator also saves 35 pounds due to the lightweight aluminum construction. To improve the responsiveness, the engine was also fitted with a custom lightweight aluminum flywheel mated to a modified Kevlar-lined clutch to take the extra power. The guiding design principle at Carobu Engineering is to make modifications that keep the original character and intent of the Ferrari automobile intact, and to make a "balanced" car. In keeping with this principle, CAROBU chooses to use high performance parts from Ferrari O.E. suppliers such as Koni, Brembo or from specialty suppliers such as Tubi-Style that build high-performance exhausts for the Ferrari Racing department. To design a "balanced" car, CAROBU prefers to make improvements in the three aspects of performance - engine, handling and braking. The engine modifications have been discussed above. In order to address the handling of the C/4, CAROBU upgraded the shocks and wheel/tire combination. CAROBU Engineering in consultation with the owner chose to convert the OEM Koni shocks to height-adjustable shocks. This conversion allowed us to lower the ride height of the car and adjust the spring rates. The stock Konis have adjustable rebound settings allowing for suspension tuning. The conversion utilizes 2.5" diameter racing springs that are available in a variety of spring rates. By choosing the proper spring rate and shock-valving combination for the desired ride-height, the handling of the car could be optimized. Since this car was to be used primarily as a street car, moderate spring rates of 300 lb/in front and 200 lb/in rear rates were used. The car was lowered approximately 1" from stock. The stock shock-valving was retained. Additionally, the stock leveling shocks were cleaned, tested and re-used. The Razzo Rosso 17" racing wheels were used to provide a good selection of modern high-performance tires and clearance for the Brembo GT brakes. Due to body clearance issues, the wheel sizes were restricted to 7.5" on the front and 8" on the rear. The owner wanted larger wheels sizes, so after driving the modified C/4 for over a year, decided to change the body work to accommodate larger wheel sizes. In the new wide-body version, the wheels sizes are 8" front and 10" rear using 235/50-17 and 285/40-17 Pirelli P-Zero tires respectively. The rear spring rates were also increased to 225 lbs/in to re-balance the handling. In addition to allowing room for the wider wheels by tasteful flaring of the front and rear fenders, the nose of the C/4 was substantially modified. The ungainly rubber front bumper was completely removed. The headlights and turn-signals were repositioned in a new front grill and the headlight doors eliminated for a cleaner look. The hood strakes remained from a previous modification. A "C" shaped accent was added right behind the front wheel arch to break-up the flat sheet metal there. Modern electric mirrors helped with better rearward vision and look surprisingly well integrated. The rear of the C/4 was also substantially modified. The rear bumper was completely removed, the tailpipes shortened and the center panel modified. A small rear kick-up was molded into the trunk lid and rear quarter panels and the body accent lines sharpened. The overall effect is to transform the 365 GTC/4 into a more muscular looking Ferrari. The interior was previously changed by adding 550 Maranello seats and removing the rear seats altogether. A rear package shelf was created to fill the rear seat area. This makes the C/4 into a true 2-seat sports car like the Daytona. A more modern steering wheel and a larger shift ball add to the enhanced driving experience. Driving this modified C/4 is very revealing. The steering, while already power assisted, has a lively feel and the turn-in is instant. City street 90º corners are dispatched with ease belying the bulk of this car. The great low end torque seems to pick the car up when the accelerator pedal is floored and hurl the car forward. The engine seems to rev with a new found eagerness not present in the standard engine. Too much speed is easily erased by the large Brembo cross-drilled rotors. No more high-speed fade as was evident in the stock system with this heavy car.